Many globes are made to tilt at an angle of 23.5° to match the actual tilt of the Earth. Incidentally, it is this tilting of the Earth, relative to the sun as it orbits around it, that causes the seasons to change and give us more daylight hours at certain times of the year. How do you find a place on a globe? Because a globe is round with no beginning or end, there are 2 imaginary reference lines from which all distances and locations are determined; these are the equator and prime meridian. Equator: Runs East and West around the exact middle of the globe. Prime Meridian: Imaginary line running from Pole to Pole and passing through Greenwich, England. The equator and the prime meridian intersect at point '0' where all numbering starts with longitude and latitude lines. Longitude: Imaginary lines running parallel with the prime meridian through each Pole and numbered in 15° increments. Latitude: Imaginary lines running around the globe parallel to the equator at 10° increments. Locations are uniquely identified on a globe by the point where the longitude and latitude lines intersect. Where can I buy a replacement light bulb for my illuminated globe? Any hardware or lighting store. Some of our illuminated globes use a 7-watt nightlight bulb, some a 25-watt light bulb, and others require a standard light bulb. Often the easiest thing to do is to take the bulb that's in the globe into your store with you. That way you know you will get the right sized bulb. What is that little round dial at the North Pole? It's called a TIME DIAL and is used to compare time around the world. Why buy a globe instead of an atlas? Actually, an atlas complements the globe and the globe complements the atlas. Each has features that, when used together, become an excellent reference and teaching tool. The advantage of a globe is that the world in its entirety is depicted on a sphere. As well as being functional, many globes also serve as attractive decorative accessories for homes and offices. How up-to-date is the globe? 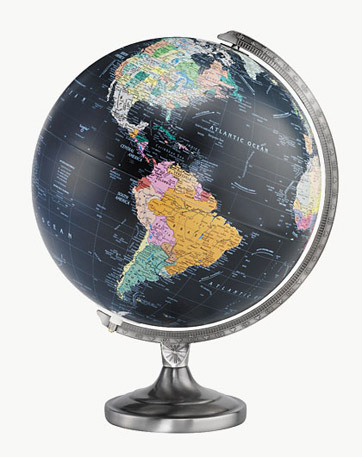 Globe manufacturers have a policy of updating a map every time it is printed. Although the names or boundaries of countries can change due to wars or other political upheavals, most changes are simple name changes that are relatively easy to make. There can be no absolute guarantee that any map is 100% current, but this should not be a deterrent to the purchase because the real value of a globe is to show true, geographical relationships. What are the globes made from? 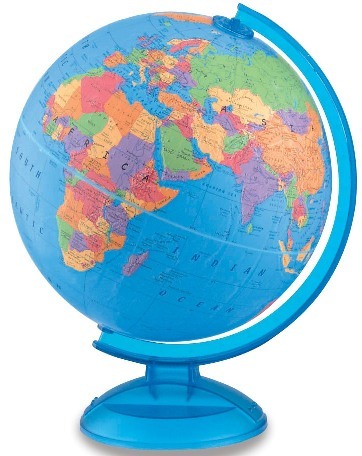 Globes can be constructed from many materials, such as aluminum, plastic, acrylic, and presscraft, which is a very dense and durable cardboard-like material. What is meant by raised relief? Raised relief appears on some globes to indicate the existence of mountain ranges. These will appear as "bumps" on the globe's surface. One globe - the Atlantis - even has raised relief to indicate the highs and lows of the ocean floor as well. What is a political globe? A political globe is one where each country is presented in a colour that distinguishes it from its neighbours. In this way, the boundaries of each country stand out. What is a physical globe? A physical globe has the political boundaries of a country drawn on it, but they aren't obvious. The physical globe, therefore, shows the geography of the planet - where the deserts are, where the forested areas are, and where the mountain ranges are. An analemma is the figure-8 path that the sun makes in the sky across the course of a year. If you were to record the position of the sun in the sky at the same time everyday, you would notice over a year's time that the sun takes a rather strange path. At certain times during the year the sun's position not only varies higher and lower (North and South) in the sky, but also slightly East and West. By the end of the year, you would find that the sun makes a figure-8 pattern in the sky. Why? Two reasons. First, the earth is tilted on its axis at 23.5 degrees in relation to the plane of its orbit around the sun. Second, the earth does not orbit the sun in a circle, but in an elipse.